Perhaps unwisely, I opted for all the optional activities, this morning for one I wasn’t sure whether it was worth the bother – to go in the Yellow Submarine. Words from, I think a Beatles song, echoed in my head. It was a sunny breezy day and we were promised sights of coral reefs. They were not what I expected, a pinky orange colour, but grey green, with small, scarcely visible fish. The water was murky. There were coral growths on a submerged tank and a larger ship, and a shoal of blue fish. The cheery guide informed us that visibility was usually better. In the afternoon we set off north along the ancient trade route for caravans to and from Africa carrying gold, frankincense and myrrh, plus much else including tar from the Dead Sea. There was little sign of agriculture on the arid hills, some signs of small ploughed fields tucked into the curves of the land but no green shoots, and only a rare flock of goats or sheep. The terrain was mostly brown dry and stony. 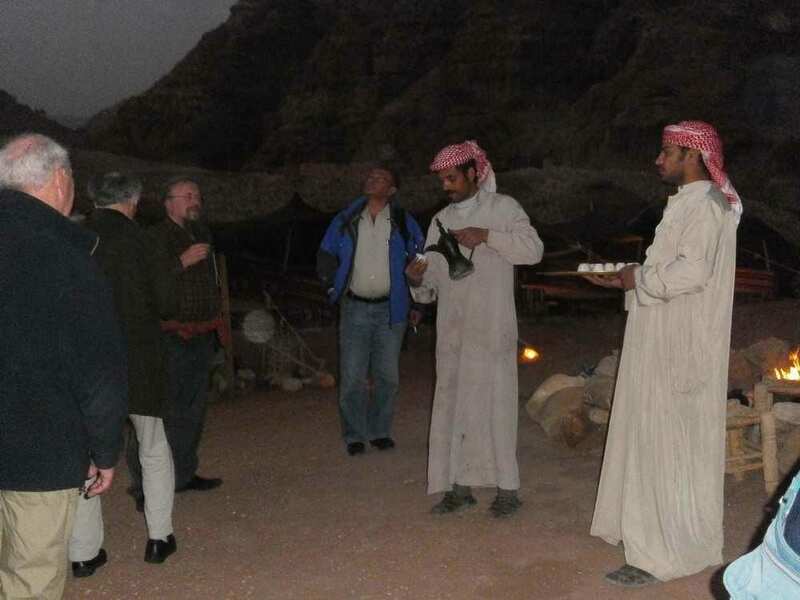 We arrived at our hotel near the visitors’ entrance to Petra to settle in before going out to another Bedouin dinner. 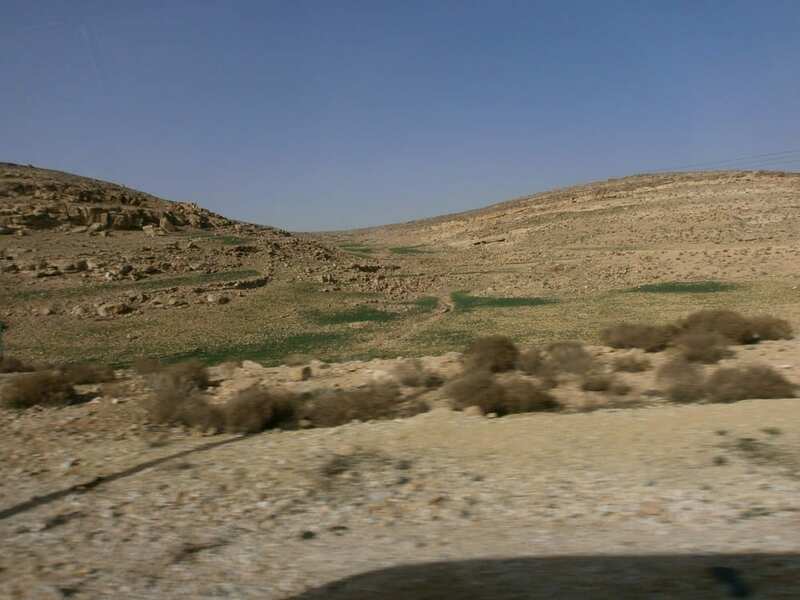 It overlooked the site of an ancient Nabatean winery, 100 BC to 100 AD, and 2000- year-old water channels. The sun was setting. We were again the only group to be welcomed. Visitors can overnight here in a Bedouin tent as I had done on my visit to Israel many years ago. Woven from sheep or camel hair, they expand at night to keep you warm and contract in daytime to let in air. We were welcomed with a glass of cinnamon tea which I came to like, and invited to see our dinner which had been cooked for hours in an underground sealed fire pit – lamb and vegetables on separate level of a wire structure holding pans and spits. I carefully avoided dishes with garlic or hot spices. We served ourselves from a formidable array of dishes to savour with bread cooked for us by the charming Fatima. While we were enjoying the food she came round to paint a pattern on our hands with henna, thought to have magical powers, and Kohl eyeliner, still popular among Bedouins as a natural protection against the harsh desert sun. We learnt that she was the eldest of 8 siblings and worked at three jobs to support them, because her father had died and her mother was too old to work.